It was announced last week that the Australian Government Digital Transformation Office (DTO) will be actively working to improve online government service delivery. Within a month, over 1 in 8 Australians ages 14 and up, will search online for government information and services. It was found that 55 percent faced problems while trying to utilise online government services. This has prompted the Digital Transformation Office to take action to correct these issues. In order to do this, DTO will work through a Digital Transformation Programme. This is a nine-week design process to create a GOV.AU model that would be built around the citizens’ needs. The programme is split into four stages: Discovery, Alpha, Beta, and Live. Throughout the four stages, DTO will map out the service landscape to recognize the technology constraints. DTO will then build Alpha prototypes which explore ways to meet the users’ needs. The Beta stage will feature a minimum viable product from the Alpha prototype to garner feedback. In the final stage, a live accessible and secure service which meets users’ needs and feedbacks. Growing the economy through streamlining business registrations, reducing errors, and increasing compliance. Over 2 milion companies exist in Australia and over 700,000 new businesses register each year. This will be done with the help of the Department of Industry, Innovation and Science, and the Australian Tax Office. Improve the processes for Australian companies engaged in International trade. More than 3.5 million import declarations are processed by the Department of Immigration and Border Protection each year. This will improve the operations and management of imported goods. Transforming the registration for Medicare for 600,000 citizensby working with the Department of Human Services. And transforming online government services across all levels. 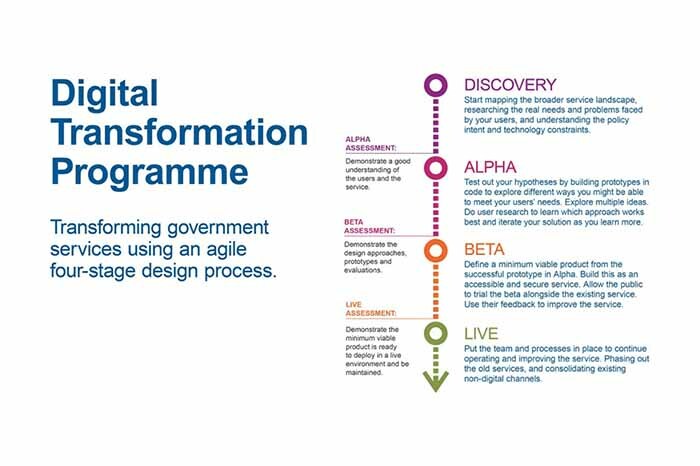 The Digital Transformation Programme highlights the growing trend of online government service consolidation. Throughout these nine weeks, DTO will work on improving the approach to design and delivery of all public sector services.